How long is an FLG Membership good for? FLG Membership periods are based on the calendar year and expire on December 31st of every year. You may renew at any point during the year, but we encourage you to do so as early as possible to take advantage of as many great members-only benefits and opportunities as possible. Do I have to sign up and pay online? I was an FLG member prior to 2017. Do I have an online account? No. 2017 marked the first year of FLG's online member management and event registration system. If you were a member prior to 2017, you will need to create an online account. You can do so easily as part of the Membership registration process. 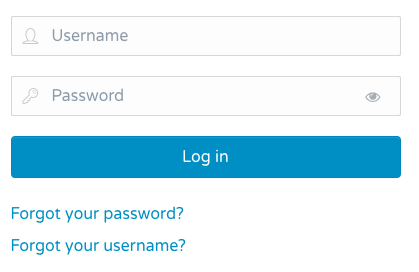 I don't remember my username and/or my password. How do I access them? • Forgot your password? Click here. • Forgot your username? Click here. What is PayPal and why does FLG use them to process financial transactions? 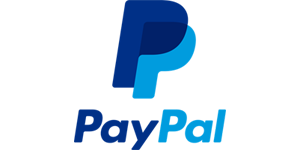 PayPal is a worldwide online payments system that supports online money transfers and serves as an electronic alternative to traditional paper methods like checks and money orders. They are internationally regulated and provide safe, secure and reliable transactional processes. FLG uses PayPal rather than paying for a more costly merchant services provider. By using PayPal, we can keep Membership and Event fees lower and more of your donation goes directly to the FLG programs and initiatives you love to support. Do I have to have a PayPal account to pay for my Membership Fees and Event Registrations or to make Donations online? While all payments are processed via PayPal, you do not have to have a PayPal account to pay by credit card. 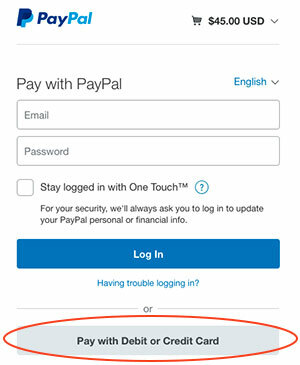 Simply look for the gray "Pay with Debit or Credit Card" button below the PayPal login section and click it to be taken to a credit card screen. Please Note: You may have to scroll down to see the "Pay with Debit or Credit Card" button, depending on your screen settings. See the screenshot here for reference. Are my Membership Fees and Donations tax deductible? Yes! FLG is a registered 501(c)3 non-profit organization, and your Membership Fees and Donations are tax deductible. As always, though, you should consult with your tax professional to determine the means of tax deduction that's right for you. Will I get a receipt for my online payments made to FLG? Yes. You will receive 2 emails when you sign up for a Membership or when you pay to attend an FLG Event online. The first will come from PayPal and will be a receipt of your transaction processed via PayPal. The second will come directly from FLG, and will include the details of your Membership or Event registration, as well as a receipt sent as an attachment. Where can I get a copy of my Membership receipt for tax deductibility purposes? 1. Log into your FLG online account. 2. A link titled "My Account" will appear in the upper right-hand corner of the screen (on a laptop or desktop) or at the top of your screen on mobile devices. 3. Click on this link and select "My Profile" from the dropdown menu. 4. Then select "Membership History" to see a listing of all your current and past FLG memberships created online. 5. In the far right-hand column will be your tax receipt. 6. Click on the receipt number to view and download a copy of your receipt. Do I have to be a registered member to attend FLG Events? Sometimes. While there are free and no-cost events open to the public (such as the annual Fireworks Over Lake Glenville), attendance at most FLG events is a benefit of membership. Additionally, as an FLG Member, you'll get access to reduced ticket costs when you use online FLG Membership account to register for events in advance. Are my Event attendance costs tax deductible? No. Event registration fees go towards the cost of the event itself.